Hungarian composer György Kurtág's 85th birthday (on 19th February) appears to have passed unnoticed in London's musical life. Although the Wigmore Hall presented an exceptional Kurtág concert on the eve of this arguably important day, it is not clear how many of the audience were aware of the significance of the chosen date. There were no announcements at the concert and, indeed, there was no mention about it – other than that Kurtág was born in 1926 – in the programme notes. Perhaps just as well, as the extraordinary high standard of the concert was not due only to Kurtág's music. While it is obvious that the contribution of performers is vital to all music, on this occasion the creativity on stage truly matched the score's content. I attended the event, the performance of the Kafka Fragments, more out of a sense of presumed duty (of a Hungarian music teacher living in London) than from enthusiastic interest. The few Kurtág performances which up to date I have experienced (in concerts given by a mixture of young performers as well as noted conductors) did not inspire me to place Kurtág into my overstretched schedule. But this 85th Wigmore birthday concert threw a very different light on the much revered composer. 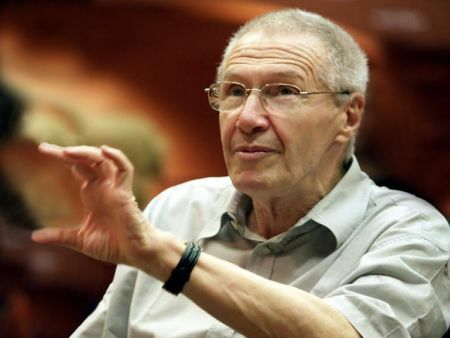 András Keller has been a devoted admirer of Kurtág ever since he studied chamber music with him some thirty-five years ago at the Franz Liszt Music Academy of Budapest. Studies with Kurtág soon led to artistic collaboration; Keller has been premiering and performing Kurtág’s works since 1978. Furthermore, his knowledge and skills have become integral to the birth of many of these compositions, including the Kafka Fragments (1985-86). In the final three bars of 'Scene on the Tram' (last piece, Part Three) the composer's instructions for the violinist include a Keller-vibrato which, as explained in a footnote, is a 'very slow, too sentimental vibrato with large interval-swing'. This is just one example of Keller's specific contributions. Without doubt, the highly inventive and fascinating virtuoso violin part owes much to Keller. I hasten to add that, most probably, the vocal part was inspired by soprano Adrienne Csengery, who premiered several of Kurtág's compositions and with whom Keller has recorded the Kafka Fragments. Of course, the main inspiration for the composition was Franz Kafka. Apparently Kurtág read The Metamorphosis in 1957-58 and gradually Kafka became more and more important to him. The textual fragments which Kurtág selected for his Kafka Fragments come from Kafka's diaries and from letters to Oscar Pollak, Milena Jesenská and Felice Bauer. While staying in Szombathely to attend a Bartók seminar in 1985, Kurtág began to sketch music to a couple of his Kafka texts initially for solo voice and solo violin but to be enlarged at a later stage. Eventually the provisional instrumentation has proved to be sufficient and final. Some of the forty segments constituting the Fragments last only for a few seconds, others up to a few minutes. In all, the whole composition lasts just over an hour. While the soprano gets first mention in the title – Kafka Fragments for soprano and violin, Op. 24 – the violin gets the more extensive part, functioning as a subdued accompaniment as well as a dramatic orchestral commentary. In fact, the violinist is instructed to use two violins: a violin tuned as normal (accordatura) and a mistuned violin (scordatura). Kurtág provides not only detailed musical and technical instructions for voice and violin, but also detailed stage directions: who stands where, when to swap places, when to put down one violin and tune the other, etc. The combination of Kafka's text and Kurtág’s input results in spell-binding high drama. The technique expected from the performers for the Fragments is formidable. In less than capable hands performances could easily turn into disaster. However, listening to soprano Juliana Banse and András Keller I could not help thinking that the performers even surpassed the composer. The purity of their individual sounds coupled with their mesmerising virtuosity raised the bar for performances of contemporary music. Although presumably Keller was in charge, their ensemble delivered chamber music at its best. Their discipline and obvious humble respect for the composer heightened the drama which they delivered on stage. We were truly in the world of Kafka. One cannot expect or even dream about more.